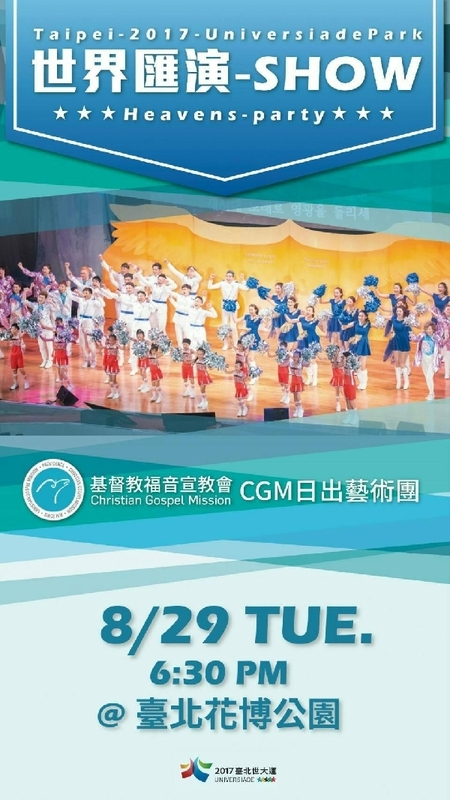 Christian Gospel Mission's Arts Group (CGM AG) is giving its performance at the Taipei 2017 Universiade. The Taipei 2017 Universiade is in full swing. Joyful news of winning gold medals and touching stories of the athletes have been heard every day. This event has not only allowed the world to see Taiwan, but also enabled the land of Taiwan to be filled with vitality and vigor. Christian Gospel Mission's Arts Group (CGM AG) will also integrate various art performances and organize a show called "Ideal World - CGM Heaven's Party" which is going to be held on Tuesday, August 29, 2017 at 6:30 pm at Taipei Expo Park. The composer of CGM AG is also going to release the new song created in particular to cheer for the athletes. Besides, there will be five groups of performers with different performing styles participating in the show, symbolizing that people who belong to different countries, voices and groups all come together to cheer for athletes from around the world and also achieve the world of love and peace through art. More than eleven thousand athletes part of 140 countries from around the world have participated in the 2017 World University Games. Through the sports values of encouraging friendship, fraternity, fair-play, perseverance, integrity, cooperation and application amongst university students, who have learned how to collaborate and deal with every eventuality, these competitions have enabled them to develop their own potential and prepare for their professional life. Despite the global conflicts resulted from the differences of politics, economics, and resources, the Taipei 2017 Universiade has not a least bit been affected. No matter what country from which the athletes are has won, the audience has never hesitated to give applaud. Just as an ideal world, the fair and equitable competitions make it a real honor to achieve the world of peace. Upholding the principle of “Charitable services and high-quality arts” advocated by Pastor Jung Myung Seok, the founder and president of Christian Gospel Mission (CGM), Christian Gospel Mission's Choir and Arts Group have been devotedly providing quality cultural and artistic performances over the years. Early this year, they collaborated with Syin-Lu Social Welfare Foundation to enable the youth of Syin-Lu to stand upon the national stage for a public welfare concert where their inspiring performance moved the entire audience. Pastor Jung Myung Seok had once said,”Art can relieve the weary body, mind, and soul, and make it more noble.” “Ideal World- CGM Heaven’s Party,” brought by Christian Gospel Mission's Arts Group (CGM AG) along with other art performance groups will take place at Taipei Expo Park. They hope that bringing positive energy to the athletes through diverse performances of music, art, honor guard, and dance will also allow the world to see Taiwan's creativity, dynamism and inclusiveness! Free admission. Please attend early to avoid disappointment.